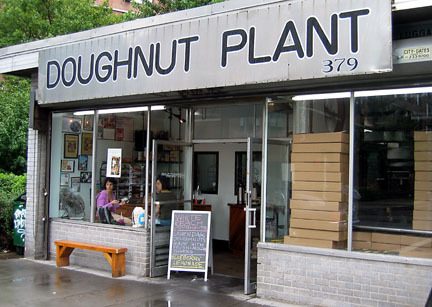 before rolling down to Hester Street, we stopped at the Doughnut Plant on Grand Street. i had every intention of going for the creme brulee or a classic chocolate doughnut, but at the last second, i was diverted by the size and shine of their cinnamon buns! cristin & i both went for it and chose the glazed buns and some coffee. 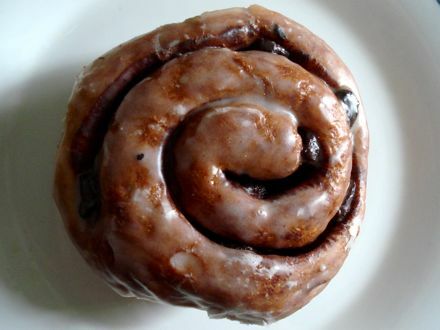 secret tip – there are raisins hiding inside the cinnamon buns. if that’s your thang, you are going to agree with the latest issue of Maxim as to why they voted the Doughnut Plant as the number #1 doughnut shop in the entire US. obviously, Maxim has never been to Voodoo Donut in Portland, OR., and honestly, i think i prefer it that way. don’t ask me what i was doing reading Maxim. it’s my best gay boyfriend, Luke’s, magazine and he tried to force it on me when i was at his apartment the other day. after shrugging away in disgust of the naked unattractiveness on the cover, we decided it was worthy of opening the issue to read about doughnuts. all in all, if it keeps the L.E.S. kids happy and unaware of my favorite NYC doughnut shop, then rock on Doughnut Plant. rock on.